Hervé Régent is a colourful personality. 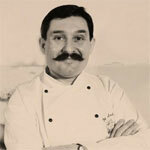 Breton and proud of it, this chef with his amazing moustache has been ruling the Lobster Pot for 18 years. His story is as original as his sea food restaurant. Starting off as a hotel management student in Thonon-les-Bains, he soon got booted off the course for speaking too much with his friend Claude Troisgros (the well-known chef's family from Roanne). So he began to work and finally moved to London to learn English. From dishwasher to chef de rang and maître d’hôtel with Albert Roux, his ascension is impressive. But it was not enough for the daring Breton. He moved to South Africa where he worked for the President. Coming back in London, he finally could work on his own, as he always wanted, because of his sturdy character, as he confesses himself. And that would be the Lobster Pot, his baby. Hervé Régent is not a man who does things by halves, and the Lobster Pot is no exception to the rule. He wanted a Breton sea-food restaurant and so he did. Eating there takes you away from everything, and with good reasons: Hervé Régent worked hard on the atmosphere. From fishing-nets to portholes and pulleys, inlayed aquarium to seagulls sounds, this wooden restaurant looks just like a boat. He used to shop at the Boilieux fair, a fair specialized for sailors, for his decoration but his wife has strictly forbidden him to go back there! 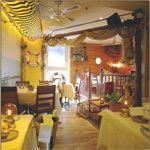 We were lucky enough to be invited there to eat and can safely say this restaurant deserves its good critics. Original and refined but never too much, he explained to us that this was a family affair. As a Breton man, he loves to cook with butter and cream but his wife is Chinese and very keen on Indian food, therefore she cooks spicy and with no butter. The result is so original: from the “Fresh White Crab Meat with mango and Avruga caviar » to the « Pancakes stuffed with crème brulée, served with raspberry sauce », everything was perfect. I especially loved the Noix de Saint Jacques and the Grilled fillet of seabass, with lemon grass, garlic, ginger chilli and coconut sauce. Three course meal plus wine would cost you about £40-60. You should definitely try the 8 course surprise menu: You just can’t be disappointed and it costs only £44.50 without lobster, £49.50 with. However this time we didn’t come just for the Lobster Pot but also for the Toulouse Lautrec. The new French brasserie just opened near the Lobster Pot. Hervé Régent bought it for his sons: Florent is the Head Chef, Nolan the Maitre d’Hotel and the youngest works here on the weekends. Once again, things have not been done by halves. The set is totally different: this former pub looks just like a typical French brasserie. And yet it was anything but a safe bet. The first time Hervé Régent was about to buy it, he discovered that the house was about to collapse. He just missed losing everything but finally, after one year of improvement works under the surveillance of the city council, the place was safe and they bought it. They could settle and they worked hard for a year and a half all by themselves: they took off 45 skips of rubbish, 43 tonnes of beams… Then decoration could begin: beams and bricks everywhere, the place got a lot of charm with its two floors and its woody stairs. And, fun fact: all the stuff in there have been purchased on Ebay! Such a personal work! Therefore the place is already full of history and personal touch: so convivial! Moreover Hervé Régent and his sons have had some very good ideas. For instance, clients can hire a table just in front of the cuisine and see the chef cooking. A private room is also available downstairs. If you hire it, you and about 9 guests could enjoy the sight of a real wine cellar and the ambiance of a vault. Original, isn't it? Toulouse Lautrec's menu is quite simple and typical for a French brasserie, wine can be served by the glass, carafe or bottle and you can also enjoy some snacks. Food is served all day. Convivial and relaxed, as I said. A piano has pride of place upstairs and the family aims to have three musicians all the time playing some jazzy musical background. A true piano-bar. As far as Toulouse Lautrec is concerned, you can enjoy several reproductions offered by Albi’s tourism office. You can also taste some of Toulouse Lautrec’s special wines or champagne with a reproduction on the bottle, or just purchase one. This family does nothing by halves, as I said! It just seems that the family Régent is going to leave his mark on London. 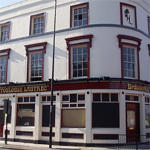 You definitely have to try the Toulouse Lautrec and to go back to the Lobster Pot.